Phillipson, Donald J.c.. "Gerhard Herzberg". The Canadian Encyclopedia, 04 March 2015, Historica Canada. https://www.thecanadianencyclopedia.ca/en/article/gerhard-herzberg. Accessed 19 April 2019. Gerhard Herzberg, physicist, Nobel laureate (born 25 December 1904 in Hamburg, Germany; died 3 March 1999 in Ottawa, ON). 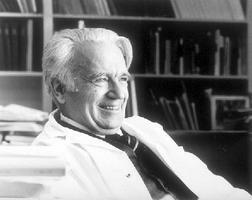 Gerhard Herzberg, physicist, Nobel laureate (born 25 December 1904 in Hamburg, Germany; died 3 March 1999 in Ottawa, ON). Herzberg began an academic career at Darmstadt Technical University after earning his doctorate in engineering there and left Nazi Germany in 1935. Herzberg taught at the University of Saskatchewan 1935-45, coming to Canada on the initiative of J.W.T. SPINKS, who had worked at his Darmstadt laboratory 1933-34. He went to the Yerkes Observatory, Chicago, in 1945, seeking better opportunities for research, and returned to Canada in 1948 to join the staff of the NATIONAL RESEARCH COUNCIL. As director of physics 1949-69, Herzberg and NRC president E.W.R. STEACIE laid the foundations of the NRC's postwar reputation as a scientific "centre of excellence." Herzberg's own research field was molecular SPECTROSCOPY, the analysis of the spectra of molecules in order to determine their structure. He specialized in free radicals, important intermediates of chemical reactions that have very short lifetimes (microseconds) under laboratory conditions. Free radicals are also found in interstellar space, where they can last for long periods, and their spectra can thus be recorded by special instruments. Herzberg and his associates developed new methods for their spectroscopic analysis. His career included more than 200 scientific publications and he earned many honours, such as fellowship in the Royal Society of London (1951), appointment as a Companion of the Order of Canada and to the Queen's Privy Council of Canada and the Nobel Prize for chemistry in 1971. He was also a vigorous participant in the SCIENCE POLICY debate following the Lamontagne report of 1970. The NRC created its highest grade, Distinguished Research Officer, especially to allow Herzberg to continue personal research after he reached retirement age in 1969 (he continued to hold the post in 1987). In 1975 the NRC's astronomy and spectroscopy units were reorganized as the Herzberg Institute of Astrophysics, and in September 1987 Minor Planet No 3316, discovered February 1984, was named after him. Gerhard Herzberg (Nobel Site)A biography of Gerhard Herzberg, winner of the Nobel Prize for chemistry in 1971. From the official website of the Nobel Foundation. Gerhard HerzbergA profile of Canadian nobel prize winning scientist Gerhard Herzberg. From the Canadian Science and Engineering Hall of Fame.